For the species sometimes referred to by this name, see Ficus religiosa. The Bodhi Tree (Sanskrit: बोधि), also known as Bo (from Sinhalese: Bo), "peepal tree", or "arasa maram" (Tamil:அரசமரம்)(Devanagari: पीपल क पेड़), was a large and ancient sacred fig tree (Ficus religiosa) located in Bodh Gaya, Bihar, India, under which Siddhartha Gautama, the spiritual teacher who became known as the Buddha, is said to have attained enlightenment or Bodhi. In religious iconography, the Bodhi Tree is recognizable by its heart-shaped leaves, which are usually prominently displayed. The term "Bodhi Tree" is also widely applied to existing trees, particularly the sacred fig (Ficus religiosa) growing at the Mahabodhi Temple in Bodh Gaya, which is often cited as a direct descendant of the original specimen planted in 288 BCE. 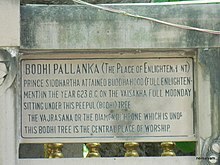 This tree is a frequent destination for pilgrims, being the most important of the four main Buddhist pilgrimage sites. 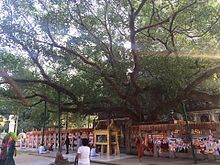 Other holy bodhi trees which have a great significance in the history of Buddhism are the Anandabodhi tree in Sravasti and the Bodhi tree in Anuradhapura, Sri Lanka. Both are believed to have been propagated from the original Bodhi Tree. 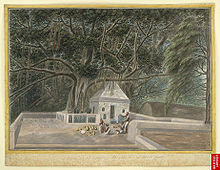 1810 picture of a small temple beneath the Bodhi tree, Bodh Gaya. The Bodhi tree at the Mahabodhi Temple is called the Sri Maha Bodhi. Gautama Buddha attained enlightenment (bodhi) while meditating underneath a Ficus religiosa. According to Buddhist texts, the Buddha meditated without moving from his seat for seven weeks (49 days) under this tree. A shrine called Animisalocana cetiya, was later erected on the spot where he sat. The spot was used as a shrine even in the lifetime of the Buddha. 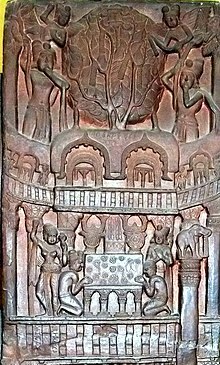 King Ashoka was most diligent in paying homage to the Bodhi tree, and held a festival every year in its honour in the month of Kattika. 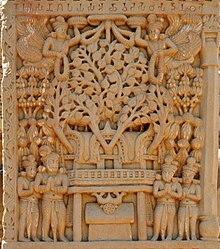 His queen, Tissarakkhā, was jealous of the Tree, and three years after she became queen (i.e., in the nineteenth year of Asoka's reign), she caused the tree to be killed by means of mandu thorns. The tree, however, grew again, and a great monastery was attached to the Bodhimanda called the Bodhimanda Vihara. Among those present at the foundation of the Mahā Thūpa are mentioned thirty thousand monks from the Bodhimanda Vihara, led by Cittagutta. The tree was again cut down by King Pushyamitra Shunga in the 2nd century BC, and by King Shashanka in 600 AD. In the 7th century AD, Chinese traveler Xuanzang wrote of the tree in detail. Every time the tree was destroyed, a new tree was planted in the same place. 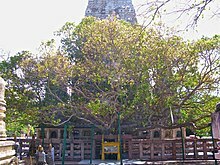 The celebrated Bodhi tree still exists, but is very much decayed; one large stem, with three branches to the westward, is still green, but the other branches are barkless and rotten. The green branch perhaps belongs to some younger tree, as there are numerous stems of apparently different trees clustered together. The tree must have been renewed frequently, as the present Pipal is standing on a terrace at least 30 feet above the level of the surrounding country. It was in full vigour in 1811, when seen by Dr. Buchanan (Hamilton), who describes it as in all probability not exceeding 100 years of age. However, the tree decayed further and in 1876 the remaining tree was destroyed in a storm. In 1881, Cunningham planted a new Bodhi tree on the same site. Ashoka's Mahabodhi Temple and Diamond throne in Bodh Gaya, built circa 250 BCE. The inscription between the Chaitya arches reads: "Bhagavato Sakamunino/ bodho" i.e. "The building round the Bodhi tree of the Holy Sakamuni (Shakyamuni)". Bharhut frieze (circa 100 BCE). Buddhism[who?] 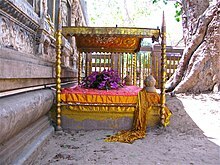 recounts that while the Buddha was still alive, in order that people might make their offerings in the name of the Buddha when he was away on pilgrimage, he sanctioned the planting of a seed from the Bodhi tree in Bodhgaya in front of the gateway of Jetavana Monastery near Sravasti. For this purpose Moggallana took a fruit from the tree as it dropped from its stalk before it reached the ground. It was planted in a golden jar by Anathapindika with great pomp and ceremony. A sapling immediately sprouted forth, fifty cubits high, and in order to consecrate it, the Buddha spent one night under it, rapt in meditation. This tree, because it was planted under the direction of Ananda, came to be known as the Ananda Bodhi. 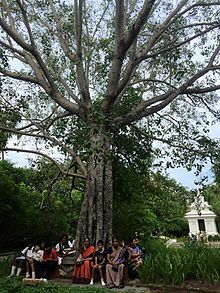 King Asoka's daughter, Sanghamittra, brought a piece of the tree with her to Sri Lanka where it is continuously growing to this day in the island's ancient capital, Anuradhapura. This Bodhi tree was originally named Jaya Sri Maha Bodhi, and was a piece of another Bodhi tree planted in the year 245 B.C. Although the original Bodhi tree deteriorated and died of old age, the descendants of the branch that was brought by Emperor Ashoka's son, Mahindra, and his daughter, Sanghmittra, can still be found on the island. In 1913, Anagarika Dharmapala took a sapling of the Sri Maha Bodhi to Hawaii, where he presented it to his benefactor, Mary Foster, who had funded much Buddhist missionary work. She planted it in the grounds of her house in Honolulu, by the Nuʻuanu stream. On her death, she left her house and its grounds to the people of Honolulu, and it became the Foster Botanical Garden. In 1950, Jinarajadasa took three saplings of the Sri Maha Bodhi to plant two samplings in Chennai, one was planted near the Buddha temple at the Theosophical Society another at the riverside of Adyar Estuary. The third was planted near a meditation center in Sri Lanka. In 2012, Brahmanda Pratap Barua, Ripon, Dhaka, Bangladesh, took a sapling of Bodhi tree from Buddha Gaya, Maha Bodhi to Thousand Oaks, California, where he presented it to his benefactor, Anagarika Glenn Hughes, who had funded much Buddhist work and teaches Buddhism in the USA. He and his students received the sapling with a great thanks, later they planted the sapling in the ground in a nearby park. According to the Mahavamsa, branches from the Bodhi trees of all the Buddhas born during this kalpa were planted in Ceylon (Sri Lanka) on the spot where the sacred Bodhi tree stands today in Anurādhapura. The branch of Kakusandha's tree was brought by Rucānandā, Konagamana's by Kantakānandā (or Kanakadattā), and Kassapa's by Sudhammā. Prayer beads are made from the seeds of Ficus religiosa, considered sacred because of the closeness to Buddha himself and his enlightenment. ^ a b Gethin, Rupert (1998). The Foundations of Buddhism. Oxford University Press. p. 22. ISBN 9780192892232. ^ Gopal, Madan (1990). K.S. Gautam, ed. India through the ages. Publication Division, Ministry of Information and Broadcasting, Government of India. p. 176. ^ Bodhi Tree British Library. ^ a b "CHAPTER XVII_The Arrival Of The Relics". Mahavamsa, chap. 17, 17. ^ "CHAPTER XX_The Nibbana Of The Thera". Mahavamsa, chap. 20, 4f. ^ "CHAPTER XXIX_The Beginning Of The Great Thupa". Mahavamsa, chap. 29, 41. ^ J. Gordon, Melton; Martin, Baumann (2010). Religions of the World: A Comprehensive Encyclopedia of Beliefs and Practices, Second edition. ABC-CLIO, Santa Barbara. p. 358. ISBN 1598842048. ^ a b "Buddhist Studies: Bodhi Tree". Buddhanet.net. Retrieved 2013-08-01. ^ Mahâbodhi, or the great Buddhist temple under the Bodhi tree at Buddha-Gaya, Alexander Cunningham, 1892: "I next saw the tree in 1871 and again in 1875, when it had become completely decayed, and shortly afterwards in 1876 the only remaining portion of the tree fell over the west wall during a storm, and the old pipal tree was gone. Many seeds, however, had been collected and the young scion of the parent tree were already in existence to take its place." ^ Luders, Heinrich (1963). Corpus Inscriptionum Indicarum Vol.2 Pt.2 Bharhut Inscriptions. p. 95. ^ K.H.J. Wijayadasa. "Śrī Maha Bodhi". Srimahabodhi.org. Retrieved 2013-08-01. ^ George Boeree. "History of Buddhism". Webspace.ship.edu. Retrieved 2013-08-01. 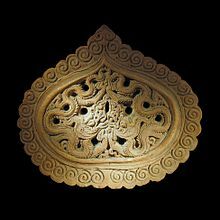 ^ "Rain-makers: The Sacred Bodhi Tree Part 2". 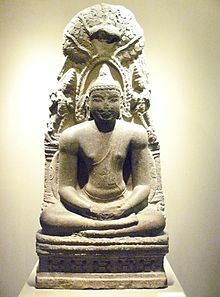 Srimahabodhi.org. 2003-04-24. Retrieved 2013-08-01. ^ Madhavan, Chitra. "Buddhist shrine in Adyar". Madras Musings. Madras Musings. Retrieved 14 November 2015. ^ "CHAPTER XV_The Acceptance Of The Mahavihara". For example, chap 15. This page was last edited on 19 April 2019, at 13:04 (UTC).